Showing 50 articles from October 29, 2014. LOUISBURG -- Hotly contested races for the sheriff's office, General Assembly and a commissioner's seat have apparently enticed the public. With about three days left in early voting -- and election day on Nov. 4 -- elections staff have been busy. By Wednesday afternoon, 4,595 people had cast a ballot. RALEIGH -- Election Day is Tuesday and while local, state and federal races will be decided, voters will also weigh in on a constitutional amendment. An amendment to Article 1 Section 24 of the N.C. Constitution would allow criminal defendants to waive their right to a jury trial in most criminal cases. Louisburg Elementary student Emily Valencia takes her turn in the pillory, a wooden structure with holes for the head and hands, a device used in Colonial times to subject an imprisoned offender to public abuse. It was a new display this year during the Colonial Hearth Day field trip that elementary students took to former educator Peggy McGhee's Franklinton farm. Parked in all the right places! LOUISBURG -- Franklin County residents are seeing ambulances in all the right places -- at least according to first responder officials. Following the release of an EMS study in September, county Emergency Services leaders worked out a plan to relocate ambulance units across the county. 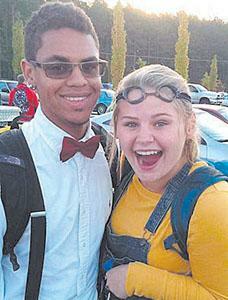 Franklin County residents will have a number of options to get their fright on this Friday. All of the town's municipalities will celebrate Halloween with Trick or Treating from 6-8 p.m. on Oct. 31. Beyond that, Franklinton will host its annual Halloween celebration downtown with a costume contest in front of Frugals, as well as an exhibit of a carved pumpkins contest in front of Franklinton Middle School. LOUISBURG -- Danica Mercer is rambunctious, has an infectious laugh and a smile that is full of life. There were plenty of times in the last three years, though, that her mother and family thought they would have to imagine life without her. At birth, Mercer, three, was diagnosed with a sacral teratoma -- a rare tumor that develops at the coccyx (tailbone) of a fetus. Boy, it's not been a good fall in Franklin County ... and if what I'm hearing on the proverbial grapevine is true, more bad tidings are a distinct possibility. Late last week we learned that Youngsville has essentially lost its post office -- or, at least a big part of its post office. The Youngsville facility has been "duoed" (the Postal Service's word) with Wake Forest, which essentially means that Youngsville will be offering only window service. A better, safer Bickett Boulevard. Who in their right mind could find fault with that? Those who regularly travel that aging, five-lane bypass are forced to drive defensively although even that doesn't always prevent mishaps. So, here we are: the last print edition of The Franklin Times before election night. A whole lot of lives will change on Nov. 4. Incumbents in a number of contested races, from Soil and Water, to County Commissioner, to the Senate and House, to the sheriff will learn whether they have a public job for the next two to four years. If I told the average Franklin County consumer that someone was running a "buy one, get one" sale I would get their attention very quickly. 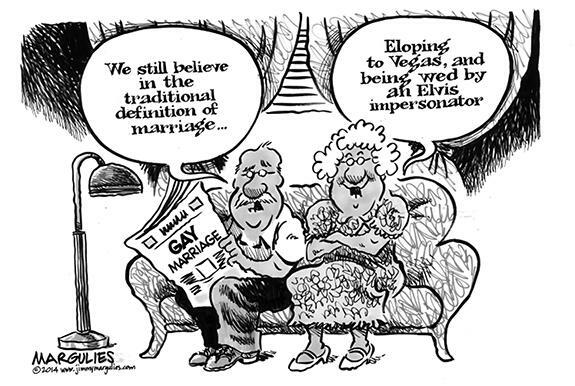 That is effectively what is happening between now and Election Day at the polling places. While Franklin County generally has a better turnout than the state or nation, still less than half of the eligible electorate will cast votes in this year's election. Remember the effort labeled as a Moral Monday movement? Buses filled with people, and money from outside of North Carolina flowed into Raleigh in an attempt to get done, by disrupting the legislative process, that which special interests within the Democrat Party could not accomplish at the ballot box. This country was founded on God, and the belief that He is our Lord and Savior. We founded this country to be free, but somewhere along the way we have lost touch from our foundation. We allowed freedom of speech, religion, among other things. Hello, I am Spencer Dickerson of Boy Scout Troop 555 and I would like to tell you why you should vote. Voting is a privilege, and I think everybody above the age of 18 should vote. Some people do not appreciate that we get the right to vote and vote for the wrong reasons. Everyone should volunteer to do community service. It makes everyone happy when there is no trash on roads, and when people volunteer to sell plates for the Shriner's fish fry or the Boy Scout spaghetti supper on election day. 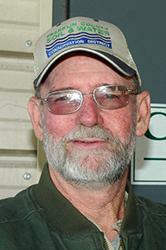 LOUISBURG - John Wayne Griffin, Sr. died on October 28, 2014 at his home in Louisburg. He was the son of the late Grover and Glennie Griffin of Fayetteville and son-in-law of the late Staley and Lois Strickland of Louisburg. He was also preceded in death by three brothers: Neal, Robert, and Grover Griffin. 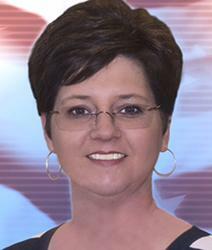 WARRENTON - Judy Pernell Rich, 70, of 1431 Alert Rd., died suddenly Monday morning at her home. 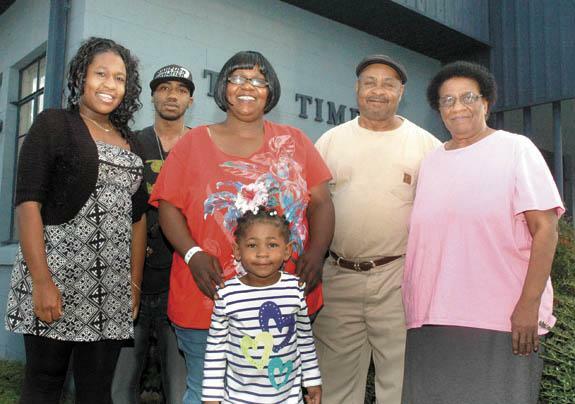 She was born in Franklin County, daughter of the late Louis Jackson and Lillie Mae Pernell. She was preceded in death by a brother, Graham Pernell. LOUISBURG - Funeral services for Mary T. "Boot" Wilson, 88, who died Monday, Oct. 27, 2014, will be held at 2 p.m. Saturday, Nov. 1, at Allen Chapel Baptist Church, with the Rev. Claude Dunston officiating. Burial will follow in the church cemetery. TURNED AROUND. Bunn's Ashton Avery (with ball) twists for yardage during last Friday night's home loss against the South Granville Vikings. 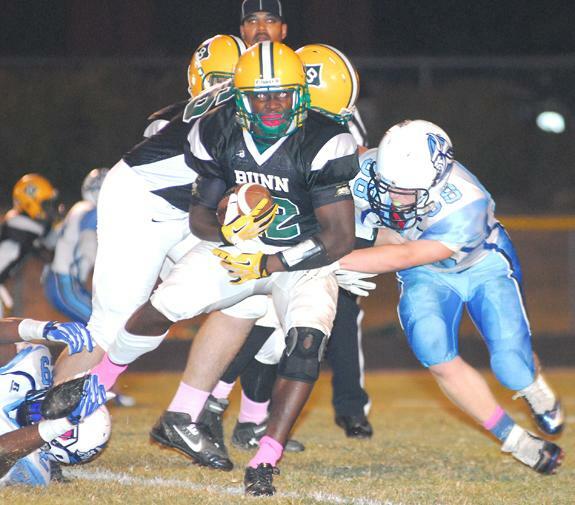 BUNN -- Bunn's defense has experienced its share of issues this season, but that side of the ball wasn't why the Wildcats lost a crucial Northern Carolina Conference football game last Friday at home against South Granville. Instead, BHS was done in by turnovers and special teams miscues, which added up to a 28-14 decision for the Vikings. South Granville remained in the NCC mix with the win, improving to 6-3 overall and 2-1 in the league. THINGS ARE LOOKING UP. 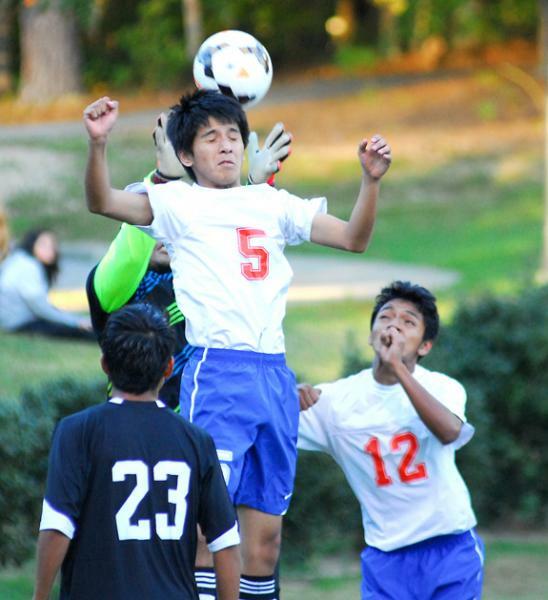 Louisburg College's Max Blackmore (left) watches the flight of the ball during last Friday's home soccer decision. LOUISBURG -- Louisburg College received a late-season reminder that -- even with the Hurricanes' lofty record -- few down-the-stretch games in Region X are ever easy, especially in the upcoming tournament. 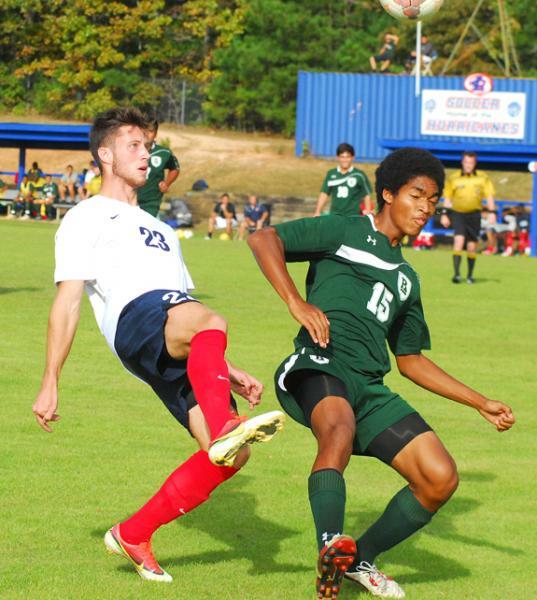 Sunday at home, LC's regular season men's soccer finale went down to the wire as a pesky Spartanburg Methodist College club took the Hurricanes to overtime. FRANKLINTON -- Opportunity awaited on both sidelines when Franklinton entertained Roanoke Rapids last Friday in a key Northern Carolina Conference football game. For the homestanding Red Rams, the chance was there to get back into the NCC title race with a victory over the league-leading Jackets. STEM -- Nothing was settled at halftime of Louisburg's crucial football matchup last Friday at Tar-Roanoke Athletic Conference rival Granville Central. With second place in the TRAC at stake, the clubs were tied at the break -- but Louisburg soon took control on its way to securing a 56-31 road triumph. ONE MORE TIME. 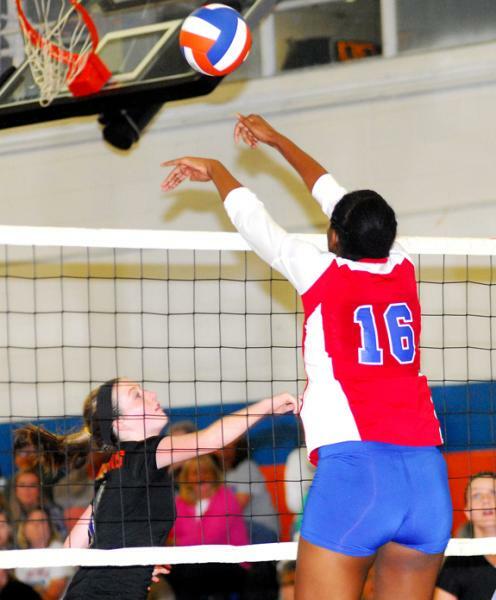 Louisburg's Vanisha Wilshire (right) goes up for a kill during last Thursday's volleyball playoff contest against Pender HS. LOUISBURG -- Last Thursday's meeting with Pender provided the tallest task of the season for the Louisburg High School volleyball squad. The tradition-rich Patriots are led by 6-foot-5 senior standout Brianna Pittman, who has received offers from several Division I schools. FIVE TAKES FLIGHT. Louisburg High School's Marcos Aguilar elevates to send a kick out of the box for the Warriors' during last Thursday's home soccer match versus Granville Central. LOUISBURG -- Tar-Roanoke Athletic Conference boys soccer fans were treated to a bonus match last Thursday when Louisburg entertained Granville Central in a key league showdown. Though the regular season had been completed -- and the squads ended in a tie for first place -- a play-in game was needed to determine seeding for the Class 1-A State Playoffs. NEWPORT -- Bunn has gained a reputation as being a strong road club the past few seasons in the Class 2-A State Volleyball Playoffs. 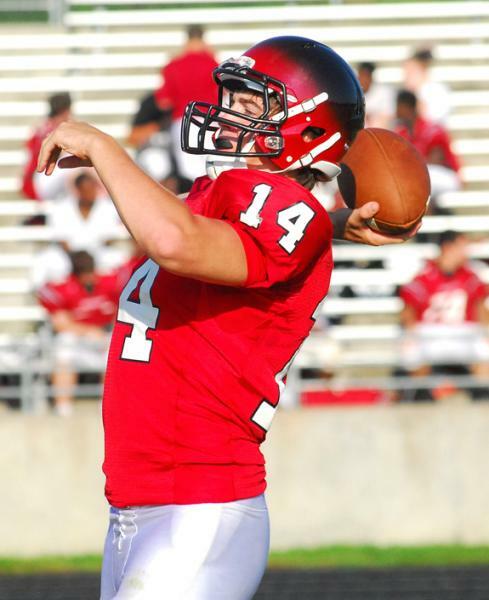 BHS lived up to that billing last Thursday in the third round of the postseason at No. 1 seed Croatan, but it still wouldn't be enough. LOUISBURG -- So much for the theory that it takes a long time to build a successful program on the collegiate level, regardless of the sport. 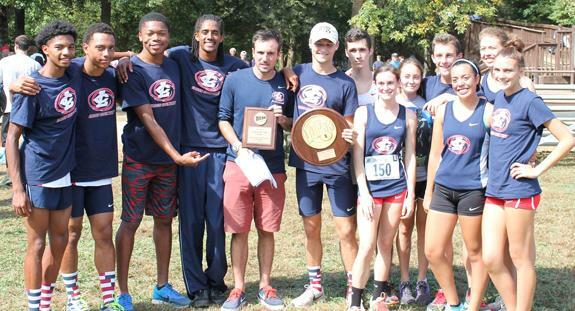 Louisburg College's cross country runners have been one-year wonders as the Hurricanes have dominated from the start against area competition under Coach Jay Koloseus. 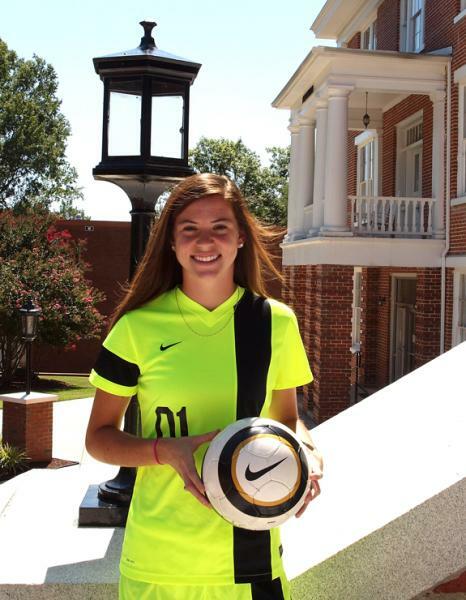 LOUISBURG -- When going over her next-level soccer options, Nash Central High School alum Abigail Ross was looking for a school that would give her the opportunity to receive immediate playing time. Louisburg College promised that chance to Ross, and that's exactly what has happened for the freshman goalkeeper. Ross has played every minute of every match this fall for the Lady Hurricanes, who will carry an 11-4-1 overall mark into this weekend's Region X Tournament on the LC campus. 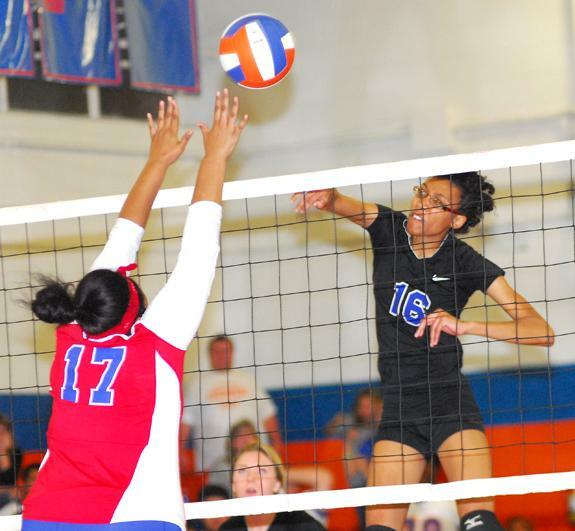 HENDERSON -- The Vance-Granville Community College women's volleyball team recently closed out the 2014 season. In an Oct. 9 match at Central Carolina Community College, the Vanguards lost, three sets to none. Kara Reese of Henderson led the Vanguards in kills (four) and digs (14), while also making three blocks and seven points. VGCC's Rachel Thomas of Louisburg contributed three kills, eight digs, three blocks and six points. ROCKY MOUNT -- On Homecoming Weekend at Bishop Stadium, the Monarchs of Methodist University came back from 10 points down in the final two minutes to force overtime and eventually steal a 42-39 win from North Carolina Wesleyan College last Saturday in football action. After forcing a turnover on downs on the Bishops' second OT possession, MU's Cody Ausherman booted home a 39-yard game-winning field goal, his fifth of the day, to secure the victory. Pender's Brianna Pittman (right) tries to block a Haley Marshall tip during last Thursday evening's state playoff volleyball contest. PERRY FAMILY GETS TOGETHER. Descendants of William Perry, one of the seven brothers who migrated to North Carolina from Virginia in the 1700's, met at Pine Ridge Baptist Church for their 18th Perry reunion on Saturday, Oct. 11. After lunch, a presentation was given on Theophilus Perry from the book "Widows by the Thousand." Perrys from Franklin County migrated to Texas before the War Between the States. Tickets are now on sale for America's No. 1 cooking school program, the Taste of Home Cooking School, which is returning to The Centre at Halifax Community College in Weldon, NC on ​Tuesday, Nov. ​18​. The event doors and Trade Expo open at 4 p.m. and the Cooking School starts at 6:30 p.m. Free gift bag filled with coupons​, ​ samples and a cookbook with recipes from the show will be offered and there will be door prizes, including the recipes created that night. The festivities of Halloween which are celebrated on Oct. 31 have been passed from border to border; from one country to another, where children as well as adults have enjoyed putting on costumes for fun or for other beliefs depending on the culture of the particular country. Some people are even convinced that this holiday is not very safe, especially for children. CENTENNIAL CELEBRATION! Emma Richardson recently celebrated her 100th Birthday. She is a resident of Green Hill Manor Apartments in Louisburg. 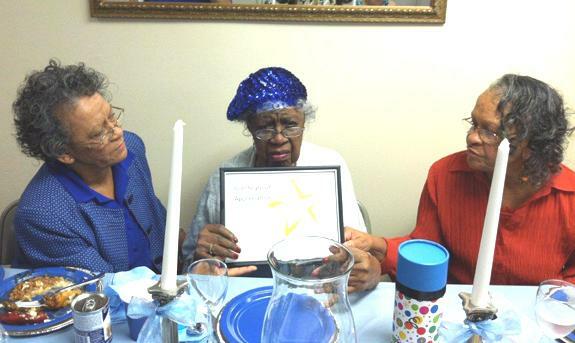 In her honor, the residents held an appreciation luncheon. She is shown seated between her twin daughters, Vernice Harris and Bernice Richardson. The United States Air Force Concert Band and three vocalists from the Singing Sergeants are hitting the road for a five-day community relations tour to North Carolina this November. The opening concert on this tour is an appearance at the Seby B. Jones Performing Arts Center at Louisburg College at 7:30 p.m. Saturday, Nov. 8. Free tickets are available at the Jones PAC Box Office, Mondays through Fridays 1 to 5 p.m.
Oh, the tales the old Franklin County jail could tell! Franklin County completed a new jail on East Nash Street in Louisburg in 1875, but it soon proved to be problematic. Living conditions and security in the facility were recurring problems. The editor of The Franklin Times in March 1889 raised concerns about the condition of the building. "The law requires (under a heavy penalty for neglect) that the apartments shall be kept clean and comfortable," he warned, "but if any one who was in the habit of living in comfortable quarters should be so unfortunate as to get into jail here, we do not believe that they could stand it very long." CELEBRATING 60 YEARS! 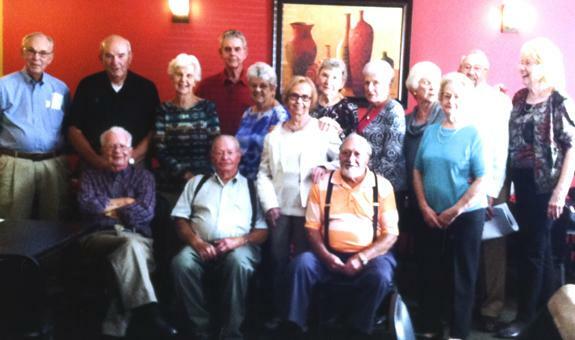 The Bunn High School Class of 1954 recently celebrated their 60th class reunion. Fifteen members of the remaining 25 attended. Pictured (standing, left to right) are Douglas Ray, Bobby Strickland, Betty Mullen, Billy Richardson, Merle Wagner, Tillie Hilvat, Mary Alford, Elaine Forehand, Barbara Tetterton, Larue Richards, Jimmy Taylor and Jean Cone. Seated are (left to right) J. D. Medlin, Wesley Privette and Harold Jones. The United Way of Franklin County awarded more than $18,000 in grants that will help nearly 2,100 students. Judges from Wake Electric went through 37 teacher applications to pick 15 winners. A reception for the winners will take place at 6 p.m. Nov. 20 at Novozymes in Franklinton. 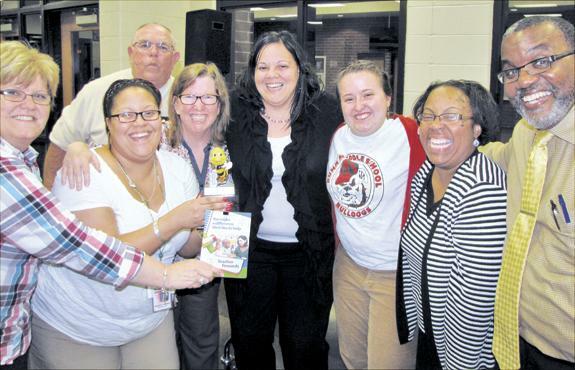 Above, members of the Bunn Middle School spelling bee team, with Principal Roosevelt Alston, right, event announcer, Dale Byrns, background, and United Way Board member Linda Frederickson, left, celebrate their victory with the Bee, named Henry after Dr. Holt, a former United Way board member and long-time Bee announcer. LOUISBURG -- Commissioners got their first report on the interest surrounding a new county library in northern Franklin County and the response so far -- while promising -- is a bit slow. The past two years, Franklin County has talked about spending as much as $134,000 for a new library in Centerville, but the issue has yet to be included in a county budget. 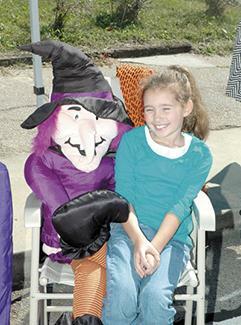 Aubrey Taylor grabs a seat next to a witch during Franklinton's Frankenfest on Main. Taylor is the niece of Diane Taylor Torrent, who had a booth at the event. 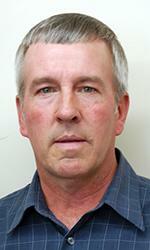 Torrent is the author of "Franklin County: Images of America," a book available for sale and at local libraries. SPRING HOPE -- Animal control officers arrested a man they allege has let his animals become a terror to the community for years. Neighbors hope the most recent charge is the one that gets Cun Chang Lin to clean up his act. Officers arrested Lin on Oct. 12, charging him with two counts of misdemeanor animal cruelty, five counts of animals running at large, two counts of misdemeanor injury to real property and unauthorized release of animals. Franklin County native Wendell Tabb recently received the Distinguished Alumnus Award in Theatre from North Carolina Central University. Tabb was honored on Oct. 3 during the Theatre Department's black-tie gala, complete with red carpet for opening night of "Leap of Faith." 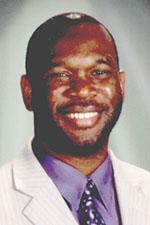 Tabb, who leads the Hillside High School award winning theatre program in Durham, "is recognized for his leadership, service and dedication to his craft," said NCCU Department of Theatre and Dance Chair Dr. Johnny B. Alston. NASHVILLE -- The county seat of Franklin County's neighbor to the east was the scene of an ambush shooting Tuesday morning and authorities were still looking for the gunmen at press time Wednesday. 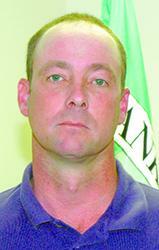 Two men were shot right outside the Nash County courthouse doors just after 11 a.m. Tuesday. 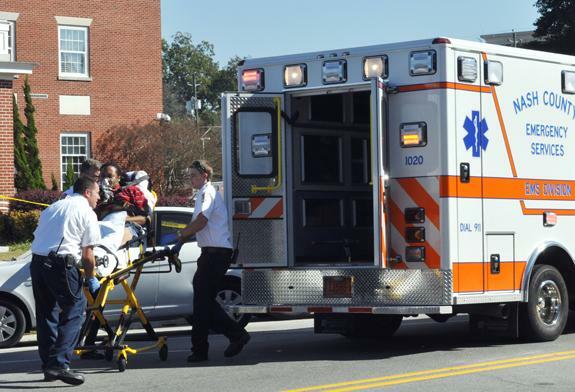 The victims, Lamar Shonte Ricks and Donte'a Evans, were transported to Vidant Medical Center in Greenville. 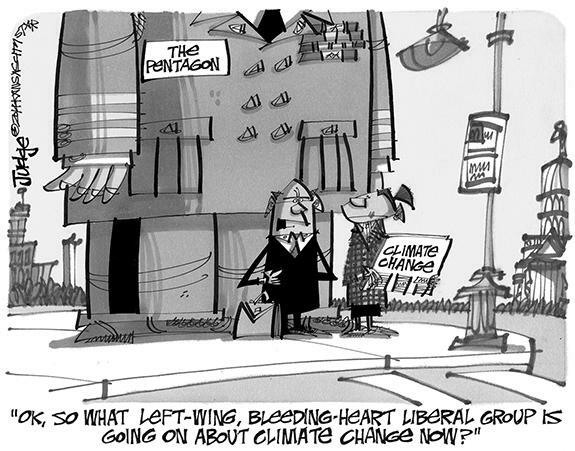 Their conditions were downgraded to critical Wednesday morning. Name: Carvel Cooke Cheves Jr.